Historical Georgetown is an American hallmark city proudly named as the Williamson County Seat located in Central Texas. Built from the dust in 1848 from industrial artisans and early settlers; the Victorian era architecture found here echos it's regal skill in the lavish homes, distinguished Williamson County Courthouse and town square within the Downtown Historic District. The clean and vibrant scenery attracts people from all walks of life - prompting an unprecedented growth of over 67,000 residents and businesses throughout Georgetown, scenic Blue Hole Park and renowned Southwestern University in recent years. Just going to visit? Getting to the Georgetown Historic District from ATX is easy! Starting from central Austin, take I-35 North to exit 262 (FM 2338/ Granger), and follow the frontage road to San Gabriel Village Blvd. Stay on that road until you take a slight right at N Austin Ave, then turn left onto W 7th street- and you’re there! Rubbish Inc. is Georgetown’s trusted leader for construction waste management and residential junk removal, keeping this glorious city ‘The Pride of Texas’. Locally owned and operated, Rubbish Inc. is the only Central Texas company to offer both the convenience of dumpster rentals and full service junk removal – so you can get just about any project taken care of with one phone call! We have several sizes of dumpsters to fit all your needs, from residential projects like cleaning out the garage to commercial office buildings or a fast paced high-rise construction job-site. Not sure which size dumpster rental you will need for the job? Our knowledgeable staff will work with you to help get you the right size, duration, and rate. Once you’ve decided on the size, let us know when and where to deliver your Georgetown dumpster rental and we’ll do the rest! Simple as that. Don’t want to get your hands dirty? Our professional junk removal crew can help! Let us know how much you have to get rid of, where it’s located, and we will come with our dumpster, load it up, and take it away. Best of all, you only pay for the space you use with our flat-rate pricing. At Rubbish Inc, we realize your home and property are important to you. That’s why our expertly trained crew handles each job with utmost care, whether it’s a complete home renovation or just cleaning up the garage. No job is ever to big or too small. Throw in the furniture, appliances, clothing, garbage, landscaping debris and more! We’ll haul it all away for you. Replacing your sofa? Have renters who left behind furniture that you don’t have time to deal with? Whether the project is preserving and renovating the timeless residential homes of Georgetown or clearing out an updated apartment building; our junk crew can haul it all (usually even the same day). Don’t leave that cluttered attic any longer. Get peace of mind with a flat rate price you can afford and the professional crew to help you get the job done! Don’t waste summers or weekends on de-clutter projects. Take the kids to Blue Hole and have some fun in the sun. To get there from town hall, head west on E 8th St toward S Main St, and take a right on the second cross street at S Austin Ave. Turn left on 3rd st, and right at Forest st- which continues onto Scenic Dr. Viola! When you run a jobsite, there is no room for errors or delays, and certainly not room for an overfilled dumpster. You work hard, and so do we. Don’t worry about late dumpsters, emergency swaps, or other issues anymore when you partner with Rubbish for the ‘Preferred Contractor program’. When you work with us, contractors can benefit from our priority service featuring benefits like; discounted rates, after hours service, extended rental periods, earning free rental service, extended rental periods and even earning free dumpsters. 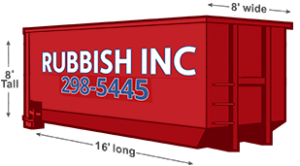 With Rubbish Inc, there is no more waiting around for late dumpster rental delivery and pick up, or limited place to put a contractor container. We’re known for our on-time every time delivery and pick up. Moreso, our experienced drivers can get your dumpster rentals placed nearly anywhere and even bring in a hard working junk removal crew to load the container for you. Schools and businesses find this service especially helpful. Not sure where to get started? Give us a call at 512-298-5445 and we’d be happy to help!